Despite the similar titles, 2015’s Emeile doesn’t act as a sequel to 2002’s Amelie. Instead, the newer movie offers a dark thriller. When Dan Thompson (Chris Beetem) and his wife Joyce (Susan Pourfar) go out to celebrate their anniversary, they leave their three kids Jacob (Joshua Rush), Sally (Carly Adams) and Christopher (Thomas Bair) with a new babysitter. At first, the kids love Anna (Sarah Bolger), as she seems fun and cool; she ignores rules and lets the younger Thompsons indulge themselves. However, matters soon intensify, as Anna shows bizarre behaviors. She lets the kids destroy household items “for fun”, and she casually inserts a new tampon with 11-year-old Jacob in the bathroom with her. These traits go down a strange path and create dangers for the kids. Though I don’t have kids, I do have dogs, and I hire a dogsitter for them from time to time. Because of that, I can relate to the leap of faith parents make when they use babysitters, though in a different manner. I worry most about theft – as much as I love my dogs, it seems unlikely a rogue sitter would harm them. Parents get the double burden. Like me, they may fear pilfering, but they also – primarily – worry about threats to their kids. Emelie capitalizes on those fears, though not in as realistic a manner as I’d like. Emelie offers a protagonist so willfully odd that she doesn’t make much sense. Anna should give us someone who presents more natural temptations to the kids, whereas her behavior turns so weird so fast – as in the tampon scene – that she doesn’t come across as credible. Anna also feels “off” from minute one. Bolger fails to infuse her with much charm, so she seems sinister the whole time and not like someone with the right attitude to charm the kids. Wouldn’t it make more sense if Anna captured the kids in her web via casual likeability? Instead, she seems vaguely psychotic. The movie needs a fun vibe from the early shots that doesn’t develop, and that mars the rest of the proceedings. In a similar vein, the filmmakers err in terms of the film’s opening. This segment makes it clear that violence is afoot and ensures that we never buy Anna as anything other than a probable villain. Lose that initial segment and perhaps we can accept her as a “good guy”, but as depicted, the viewer suspects her right off the bat, and that cancels potential development and tension. Emelie doesn’t stop there, as it telegraphs far too many other story components. We get clunky moments of exposition that set up bits and pieces in too obvious a manner, and even Anna’s backstory gets explained in a stiff, artificial way. In general, the movie leaves too little to the imagination. A better-told tale would develop characters and story beats gradually, but Emelie almost wholly eschews subtlety, and that’s a bad choice for this genre. As a result, Emelie lacks even a hint of tension or anxiety. So much of it proceeds in a ridiculous manner that it becomes difficult for the viewer to invest in any of the circumstances. It’s blunt and obvious when it needs to be sly and subtle. All of this adds up to a wholly limp attempt at a thriller. The basic story of Emelie comes with potential, but it fails to find the drama at the heart of the narrative. A supposedly reality-based movie like this shouldn’t require so much suspension of disbelief. Emelie appears in an aspect ratio of approximately 2.40:1 on this Blu-ray Disc. Overall, the transfer seemed generally positive. Sharpness looked good. Softness hit some wider shots, but those instances remained infrequent, so the majority of the flick showed more than acceptable clarity and accuracy. Jaggies and shimmering failed to distract, and edge haloes remained absent. The movie also lacked any source flaws and was consistently clean. In terms of colors, Emelie went with subdued tones, as the movie tended toward a teal feel; some ambers cropped up as well. The hues never stood out as memorable, but they weren’t supposed to be impressive, so they were fine for this story’s stripped palette. Blacks were pretty deep, and shadows were well-depicted. The image offered a solid “B” presentation. As for the movie’s DTS-HD MA 5.1 soundtrack, it lacked a ton of ambition, though I didn’t view that as a flaw. A story like this came heavy on ambience and light on opportunities for fireworks, so the absence of showy sequences failed to become a problem. Music filled the various channels in a satisfying manner, and low-key effects fleshed out the spectrum in a logical manner. Nothing dazzled but the mix seemed workable for the material. Audio quality pleased. Speech was concise and natural, while effects – as subdued as they tended to be – remained accurate and full-bodied. Music was vibrant and dynamic. While this was never a memorable track, it suited the story. A Making of featurette runs 13 minutes, five seconds and offers notes from director Michael Thelin, writer Richard Raymond, co-producer Robyn K. Bennett, producer Andrew Corkin, and actors Chris Beetem, Susan Pourfair, and Sarah Bolger. We learn of the movie’s roots and development, story/characters, challenges for first-time filmmakers, cast and performances, and the tale’s conclusion. Despite its brevity, “Making” gives us a decent array of details. It remains too short to deliver much substance, but it’s better than average. The disc opens with ads for Scherzo Diabolico, Cherry Tree, Traders and Convergence. We also find the trailer for Emelie. 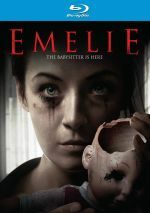 If one hopes to find a good “babysitter from hell” tale via Emelie, one will encounter nothing but disappointment. 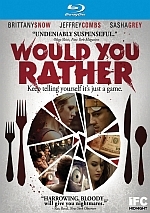 Silly, contrived and completely devoid of tension, the movie feels more likely to pack laughs than scares. The Blu-ray delivers generally positive picture and audio but lacks substantial supplements. Emelie turns into a goofy dud.